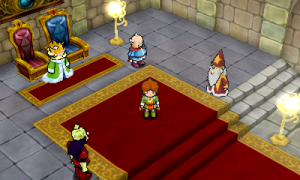 It has been ten years since the world could get to know the story of Pietro in PoPoLoCRoIS. This game was one of many but it was the first PSP title to be released in Europe and America. Pietro got into quite an adventure, in which he got loads of new friends. 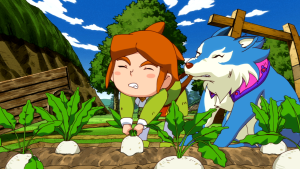 Now, Pietro is back with a brand new story, which also involves farming. Get your gloves and let’s start digging. It has been three years since our little prince Pietro has ended his adventure. It seems that things are back to normal and Narcia is living with her sister in the woods. Today is the birthday of the young prince and a lot needs to be done, but he is nowhere to be found. The chancellor sends Gomer on a quest to find him. Pietro isn’t that far away, as he is doubting to go to see his old friend Narcia. It has been a while since they last saw each other and he’s troubled with what she’ll say. Thanks to the help of Gomer, they eventually are on their way to see her but the trip is in vein, as she isn’t home. Time is running out, so they return to the castle to continue the festivities. The celebrations are overshadowed by some depressing matters. There are rumors of ‘Black Beasts’ which taints everything it touches. Thank goodness that your father has requested the aid from a queen of a foreign country. It is not before long of our young friend will go on his next adventure. 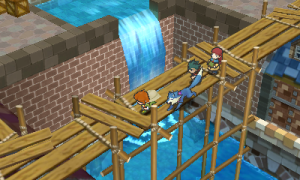 Expect loads of bright colors and changing environments, as this game is a waterfall of vibrant hues. When you first start the game, you’ll have the quite cold environment of the castle, combined with the buzzy features of the town and the gentle and soft shades of the forest. The characters of Return to PoPoLoCrois: A Story of Seasons Fairytale have their own particular elements which make them really stand out in comparison with the background. Each and one of the key players have their own characteristics that will emphasize their personality. For instance, Nino has some rough edges and basic, fighter clothing that make him even more of a blunt guy. Quality wise, you can expect an above average scenery, although it feels like there is an overall blurriness. The graphics could have been more sharp, although the game asks you if you want to have an extra outlining around your characters, to make them easier to spot. Overall, you’ll notice that the developers have kept the same cartoonish features as the previous instalment. 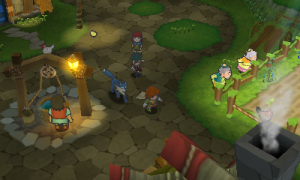 Return to PoPoLoCrois: A Story of Seasons Fairytale brings you really cheery tunes, combined with some rather eerie sounds when you visit some more dread areas. The developers certainly thought about the sound effects as well, as you can hear a lot of little bugs jittering in the bushes or the water flowing when you give your plants their much needed nutrition. If that isn’t enough, you can choose between two different Japanese voices or an English set. This is really nice, as you can choose how your gaming experience will sound like. 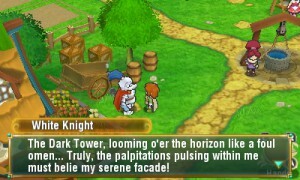 Each cutscene is fully voice acted, so you can enjoy your choice more than often. If you like the Rune Factory-franchise, you’ll definitely like this game as well. Return to PoPoLoCrois: A Story of Seasons Fairytale is an adventure simulation game that makes you slaughter baddies while giving you the opportunity to grow vegetables and herd animals. 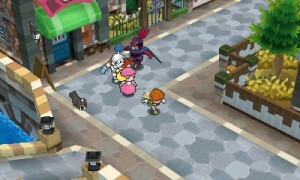 The main purpose of the game is to find a solution to fend of the black beasts, which require you to travel a lot and fight monsters. Thanks to the previous title, our good friend Pietro already has lots of experience and he is able to find new allies sooner or later. Together, they take on the enemies and try to get everything back to normal. Fighting wise, you’ll be presented with a strategy based system where you and your opponents are randomly placed on a gritted map. It may occur that there is some rubble or other obstacles on the field, implying you need to get around that. At any rate, you and your friend are always at the same side so you don’t need to worry that one of your allies is separated and in range for some bashing. Each character has their own set of attacks and skills, which can both be used during battle or when you’re running around on the field (healing spells for instance). These can be trained by battling many monsters, just as you can level up as well and increase your range. Each character also sometimes has a combined spell with one of his allies, although this might cost a lot of MP. Before you can actually attack, you need to wait until a specific bar is loaded. This gives you the opportunity to run around and strike. It would have been nice if you could see your enemies’ bars as well, as it is guessing when your opponents will strike. This can be a matter of life and death, as you would use a healing item or spell sooner for instance. You’ll encounter loads of enemies and it might get a tad boring after a while to always run yourself and attack. That’s why you can let the game fight on its own, although this might not get the best outcome at times. At any rate, it is a fun element and nice to have when you’re doing some other stuff as well. If you’re facing enemies, you’ll definitely need armor. These lifesavers can be bought in several places and are really worth looking for, together with weapon improvements. Next to all the fighting, you can also get into farmlife and start planting veggies. This means you will also give it plenty of water for instance. 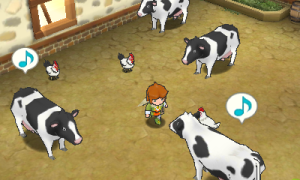 Instead of games like Harvest Moon or Rune Factory, there isn’t any time indication. Your plants seem to grow when you talk to people or fight against enemies. When your babies are thirsty or ready to get harvested you get a prompt, making it easier to keep track of everything. 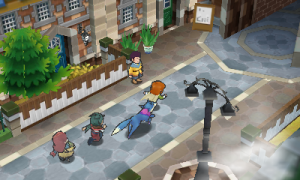 At a certain moment in the game, you can also travel instantly to places you’ve already visited which is such a convenient tool. If you had enough of both fighting and farming, you have some other things you can attend to. For instance, you can synthesize items at your farm, which means you need to combine two items to get a brand new one. Squashing two oranges together in the machine gives you some nice orange juice (which can be sold for a lot more). Another possibility is to go on a bug hunt or start collecting ore. Enough possibilities to keep you busy. Return to PoPoLoCrois: A Story of Seasons Fairytale will take you on an adventure where you have best of two worlds: fighting and farming. The graphics might seem blurry but you’ll be treated with an explosion of colors and fun music and voice acting. If you’re fed up with following the story, you can always go on a bug hunt or mining spree.